A status report on the space shuttle program's efforts to fly the second post-Columbia test flight, including changes to the external fuel tank, is provided in this news conference from Kennedy Space Center on Feb. 28. The participants are Wayne Hale, shuttle program manager, Mike Leinbach, shuttle launch director, and Tim Wilson, external tank tiger team lead. Space science funding, the Vision for Space Exploration and the recent controversy over public affairs clashing with agency scientists. These topics and more are discussed in this NASA employee question and answer session with Administrator Mike Griffin and Deputy Administrator Shana Dale held Feb. 27 from agency headquarters in Washington. This false-color composite image of the Stephan's Quintet galaxy cluster clearly shows one of the largest shock waves ever seen (green arc). The wave was produced by one galaxy falling toward another at speeds of more than one million miles per hour. The image is made up of data from NASA's Spitzer Space Telescope and a ground-based telescope in Spain. 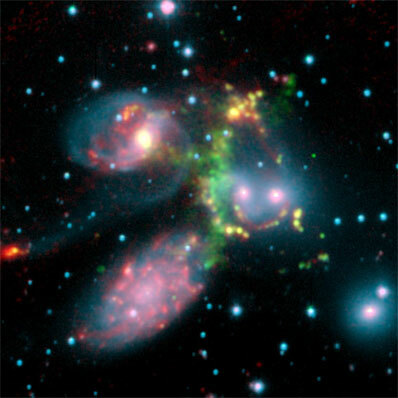 Stephan's Quintet is located 300 million light-years away in the Pegasus constellation. This image is composed of three data sets: near-infrared light (blue) and visible light called H-alpha (green) from the Calar Alto Observatory in Spain, operated by the Max Planck Institute in Germany; and 8-micron infrared light (red) from Spitzer's infrared array camera.